Treat them to a magic show – they'll love you for it! Children's and Family Entertainer in Essex, Suffolk, Cambs & Herts. 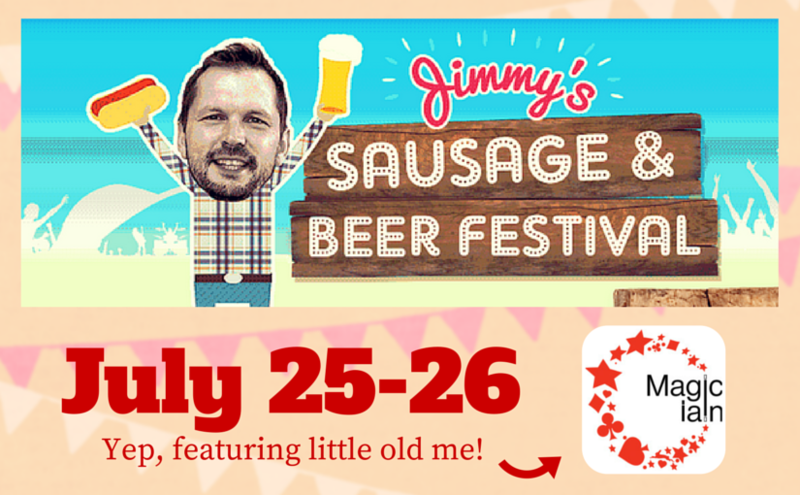 I am delighted to announce I’ll be appearing at Jimmy’s Sausage & Beer Festival 2015! It’s the weekend of the 25th and 26th of July at Jimmy’s Farm, Wherstead. I’ll be performing my magic show in the giant tipi on the campsite for the children that are camping for the weekend. Other acts over the weekend include Justin Fletcher and Mr. Bloom from CBeebies, Toploader, Athlete and Chas ‘n’ Dave! Does this mean I can say I’m performing on the same bill as Toploader? The Sausage & Beer Festival won silver in last year’s Festival Kidz Awards and is a great event to take the whole family to. Camping tickets are sold out but you can still buy individual and family tickets for each day – check the Jimmy’s Sausage & Beer Festival 2015 webpage for loads more information. Previous Previous post: Circle Game: Duck, Duck, Goose! Next Next post: A Magic Hat Birthday Cake!